The Supreme Court totally rejected everything the US was built upon, no taxation without representation. New Homes surge in only one area the South, the rest of the country new homes plunged. Europe warns of an upcoming trade collapse. The Fed just let the world know what is about to do but no one clued in on what the Fed was saying. The Fed announced that is moving full steam ahead with popping the bubbles, add to this the statement by the BIS, where banks are insolvent, this collapse scenario is now unfolding right in front of our eyes. NSA has hidden spy hubs all around the US. 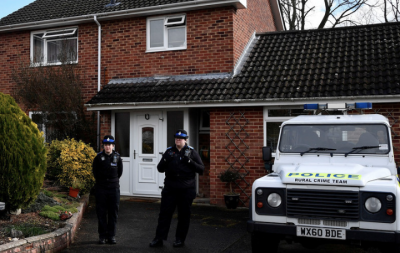 The Skripal’s house is going to be purchased by the UK government using tax payer money. Italy is pushing back against Merkel and the rest of Europe is starting to break apart. North Korea receives coffins from the US. War drills have been permanently suspended in Korea. Sudan is has begun peace talks. The deep state airlifts two IS commanders out of Syria. Assad says he will push foreign troops out of his country and rebuild with money from his allies which means Russia and China. Big news will be coming out of the mid east, US troops are distancing themselves from the paid mercenary forces, the people in Syria do not want foreign troops in their country. In the next couple of months we will be hearing news about the soldiers coming out of Syria. compelled Colonists to pay taxes yet they were NOT represented in the English Parliament to object. This is the most fundamentally UNCONSTITUTIONAL and ant-Democratic decision EVER handed down by the Supreme Court all because of the Hunt for Money by the States. Following major disappointment in exiting-home-sales, May New Home Sales exploded higher, up 6.7% MoM (smashing expectations of 0.8% gain) helped by a major downward revision to April. Our world will go back “to a trading environment where rules are only enforced where convenient and where strength replaces rules as the basis for trade relations,” according to the memo. I think the Fed’s biggest news from that meeting may have slipped under the radar. Chairman Jerome Powelldelivered an important message that went largely unreported, and I expect him to keep at it until people take notice. three are goals in that sentence. Needless to say, Yellen never defined the Fed’s role in the same way. She never elevated financial stability to a position alongside the traditional goals of full employment and stable prices. And take note, Powell was answering a question about wage growth—there was no prompting whatsoever. Once again, Powell cited financial risks as a potential trigger for monetary tightening. And once again, his phrasing (namely, the conjunction “or”) suggested he could raise rates quickly even without an inflation threat. Essentially, Powell announced he’s not afraid to pop bubbles, meaning both asset-price and credit bubbles. Depending on how far he decides to take it, he could even act to prevent bubbles before they inflate. According to the NSA’s documents, it values AT&T not only because it “has access to information that transits the nation,” but also because it maintains unique relationships with other phone and internet providers. The NSA exploits these relationships for surveillance purposes, commandeering AT&T’s massive infrastructure and using it as a platform to covertly tap into communications processed by other companies. Merkel was stunned after the Italian prime instead called for “radical change” in the EU’s so-called Dublin principle that makes frontline countries such as Italy responsible for dealing with asylum claims and allows for registered asylum seekers that move on to another country to be sent back to the state they landed in. Conte called for “severing” the link between the “safe port of disembarkation” and the “competency to examine asylum rights”. Conte also proposed that “protection centres” for processing asylum claims should be set up in other EU countries – such as Germany – as “hotspots” to avoid overcrowding in frontline states – such as Italy. France and Spain have backed a similar plan but the idea has been criticised by the Netherlands. In other words, migrants picked up from Libya would be processed… in Libya. Peace talks to end the unrest in South Sudan were launched in neighbouring Sudan today attended by South Sudanese President Salva Kiir and opposition leader Riek Machar. The talks, which are expected to last for at least two weeks, are being held under the sponsorship of Sudanese President Omar Al-Bashir in the capital Khartoum. The US-led coalition (deep state) has reportedly airlifted two senior ISIS commanders from a small village in northeast Syria near the Iraqi borders in coordination with its Kurdish allies controlling the area. two helicopters of the US coalition landed in Twimin village in order to transport two senior commanders from the Islamic State terror group to the US base in Al-Shaddadah town. In a released video statement, the Popular Resistance in Manbij has announced the start of preparations for an uprising against foreign occupiers – i.e. forces of the US, France and Turkey. The jihadist rebels have agreed to surrender the entire Al-Lajat region of northeast Dara’a to the Syrian Arab Army (SAA) after suffering several setbacks this past weekend. Syrian President Bashar Al-Assad recently sat down with Russia’s NTV to discuss a number of topics currently affecting his country. The Syrian President answered several of his interviewer’s questions, which included how will Syria prevent terrorist groups from resurfacing and what is the future of northern Syria. President Donald Trump claimed Monday that a “lot of progress” has been made in the Middle East, but he did not identify specific areas of improvement. Trump commented as he welcomed King Abdullah II of Jordan to the White House for a working visit. Obama spent two months after leaving the Oval Office traveling the globe and continues to pay close attention to international events and meets with world leaders like Justin Trudeau and Angela Merkel.